What Is a Public Address Amplifier? A public address amplifier raises the volume of speech so people can be heard clearly in a large area or throughout a building. Inputs feed from one or more microphones through the device, which increases the power of the signal. The amplifier pushes the signal to outputs which relay the speech through speakers or horns, depending on the design of the system. Some systems are very complex and provide coverage throughout a building or complex, while others are small and mobile, designed for activities like giving lectures in classrooms or public facilities. At a minimum, the public address amplifier has at least one microphone input and a speaker output or built-in speaker. Many include several different microphone channels to allow people to use the system from several locations. At a music venue, for example, the public address system might include microphones in the box office, in the technical booth, and on the stage itself, providing several areas for making announcements. This can be especially important in emergencies, where personnel may need to convey information quickly. Mixers can also be embedded into a public address amplifier. The controls allow an operator to adjust the curve of the sound for different settings and speakers. 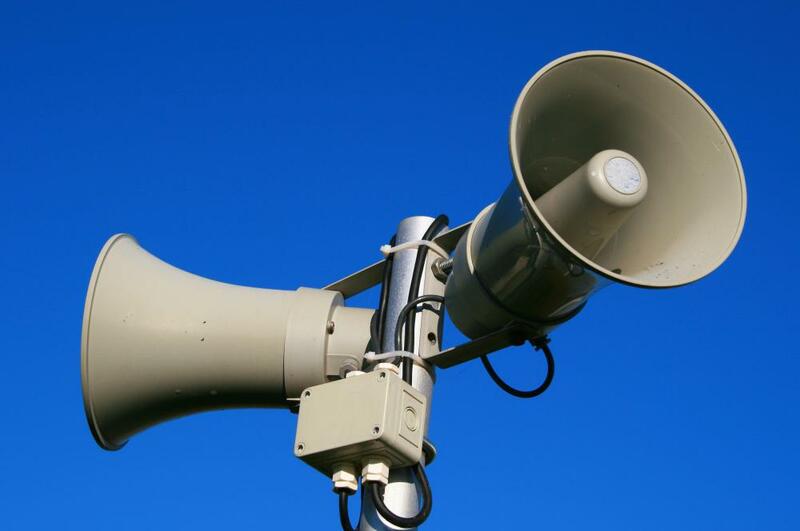 Someone who is naturally loud, for example, may require some level adjustment so the amplification doesn’t cause distortion. Advanced systems apply mixers to different channels to allow technicians to control the levels for each microphone input. This provides greater control and functionality. Some enable two way communication. Microphone inputs by the speakers allow people receiving messages over the public address system to respond. At a school, for example, teachers may be able to activate a button to send a message to the office through the public address amplifier. This can be useful when people need to call for help or respond to a directive like a request to confirm that all the students are secured in the classroom during a lockdown. Costs for a public address amplifier can depend on the complexity of the system. Sometimes it is possible to get a discount by purchasing an entire public address kit, including speakers, microphones, and wiring. When selecting a system, it is important to think about projected uses that may change over time, to ensure that the system is flexible enough to meet ongoing needs. If people are likely to want more microphone inputs in the future, for example, they might want to purchase a more costly system with more inputs than they need to be prepared for more demand. What Is a Pignose® Amplifier? What Are the Different Types of Microphone Speakers? What is a Line Amp? What is an Amplified Cordless Phone?